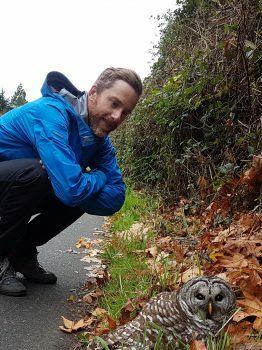 Congratulations to Animal Welfare Program alumnus Geoff Urton; BSc Animal Science 2000, MSc Animal Science 2005, on receiving an award for the 2018 Top 20 Under 40 Business and Community Achievement Awards on Vancouver Island. Over the past decade, Urton has had a great impact on improving the lives of animals on Vancouver Island and across Canada — and it’s been all through strategic partnerships with the business sector. Urton’s nationally awarded work as general manager of strategy and innovation for the B.C. SPCA has set new benchmarks for not-for-profit government relations, and forged an innovative model for business and NGO collaboration that has created win-wins for major Canadian food retailers and animal industries in setting new national expectations for the humane care of animals. Urton is proud of his community service to influence the health and wellness of children and families. photo credit: Geoff Lister, UBC Communications & Marketing.